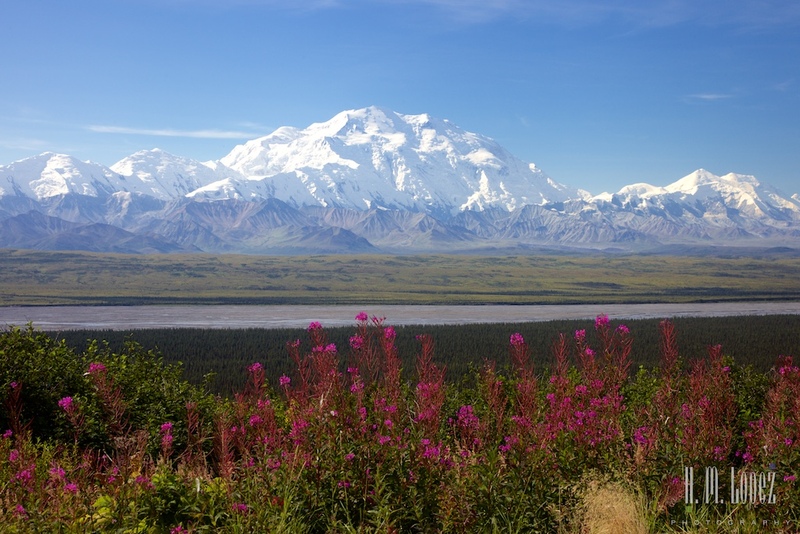 There are several opportunities to see Denali, the high one, from the road that runs across Denali National Park and Preserve. 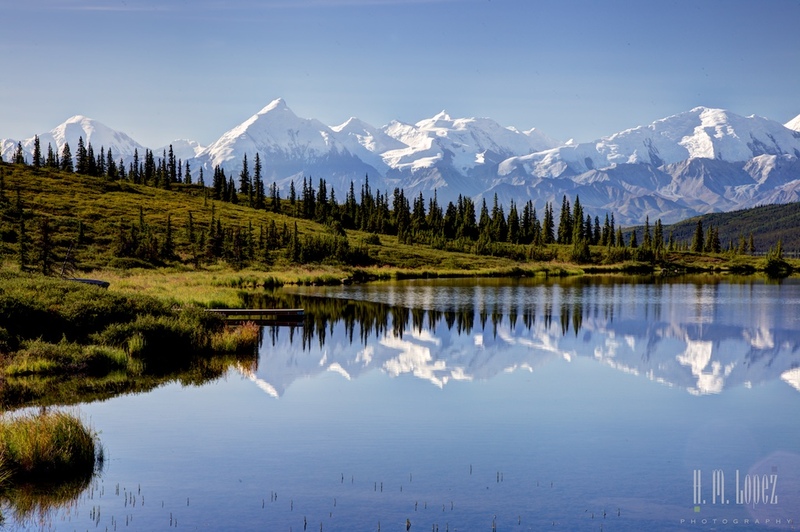 As the road rises from forest and woodland habitat in the lowlands to the subalpine meadow and open woodland, the mountain can sometimes be seen just peeking behind a closer mountain range. 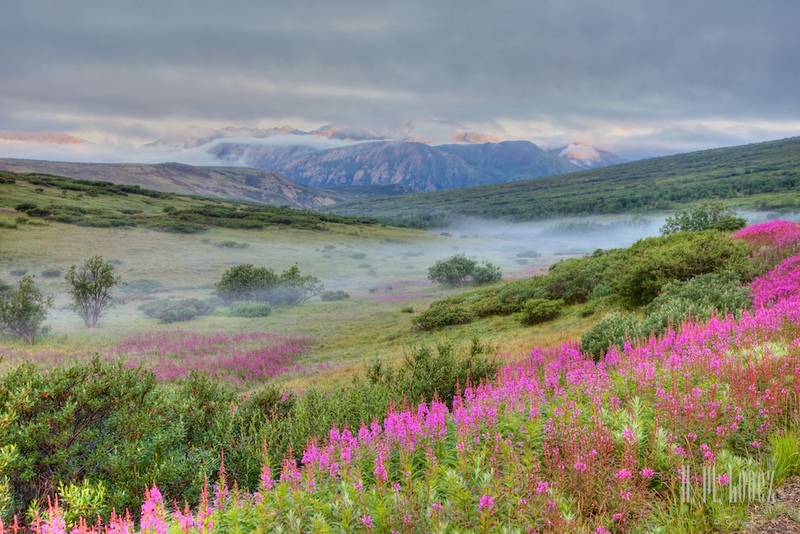 Then, as the first two of four passes rise up to and down from the alpine area of low tundra, there are two places that offer a full view of the mountain (when she wants to be seen): Stony Creek and the Eilson Visitor Center. We set out at 5:00 A.M. in order to catch the beautiful morning light and also to be ahead of the first morning buses. 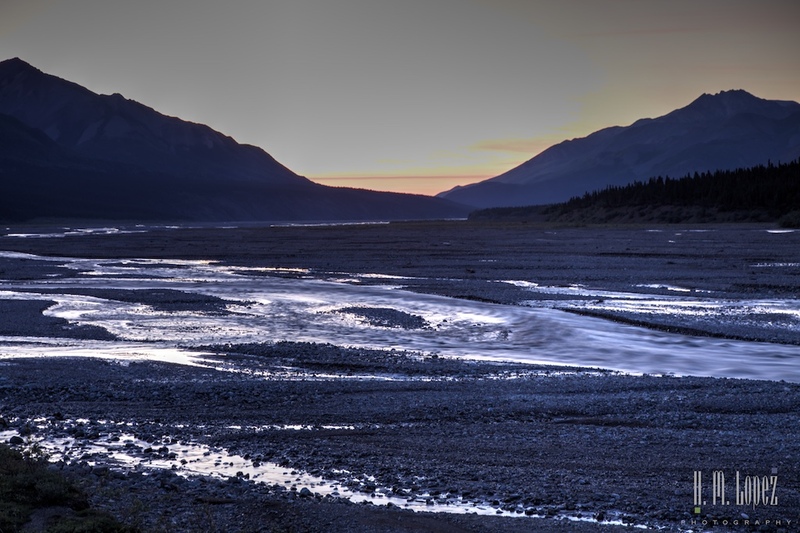 Since we began our drive at mile 29 by the Teklanika River where our campground was located, we had a large head start on the park buses that leave from the visitor center at mile 1. We saw almost no-one early in the mornings, only the very occasional other car (park employees and service vehicles). It was truly special to be the only ones out on the road. Absolute solitude. We took Angel with us on all of the morning drives, as we never knew how long we were going to be out. 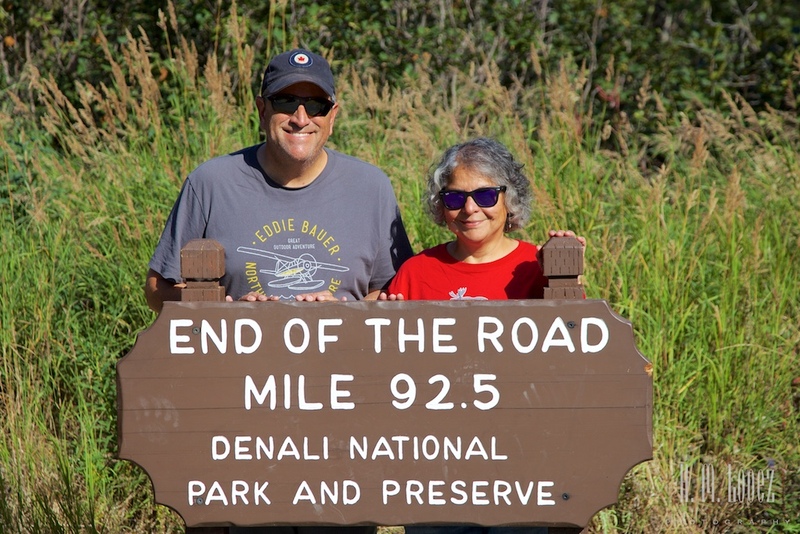 National Parks do not allow dogs outside of the roads, visitor centers, turnoffs and other developed areas so it was a bit restrictive but we made it work. 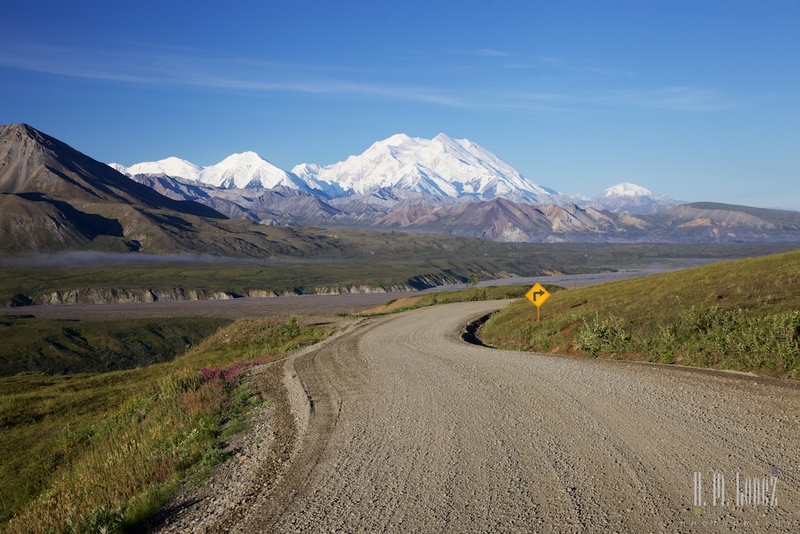 Our second day driving in Denali was full of promise. The forecast was for a clear, sunny day, and we were excited about seeing the mountain for the first time. 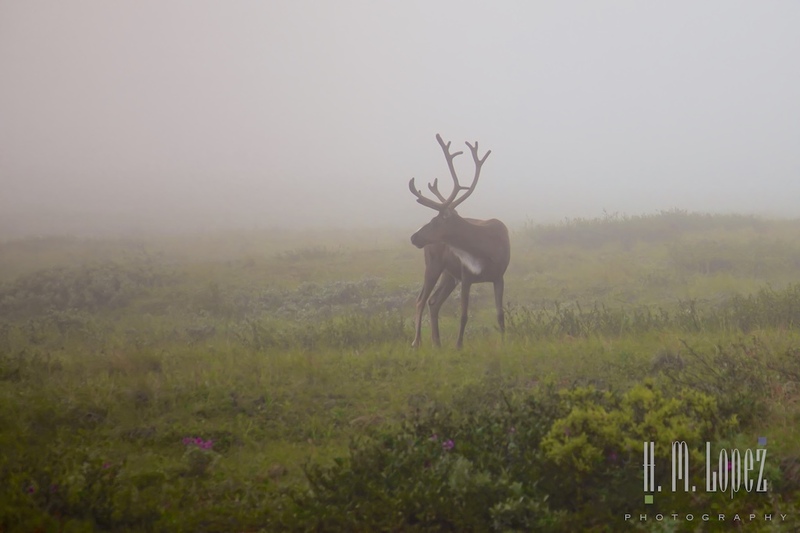 That morning we encountered a dense fog as we went over the first pass, Sable Pass. 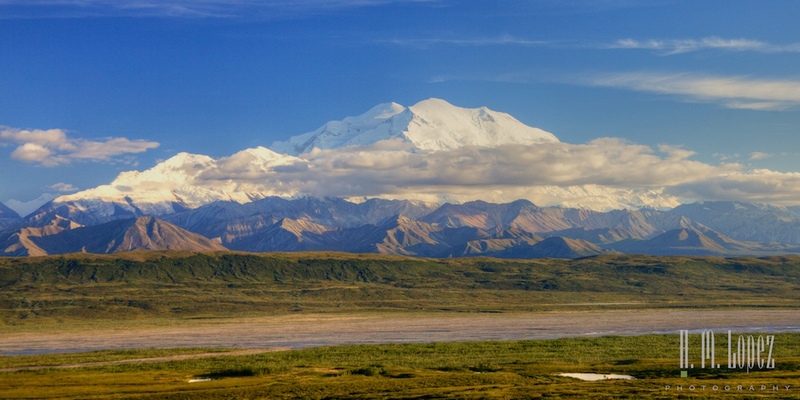 Weather changes quickly in this area so we were a bit concerned about whether Denali was going to be visible. But fog has a unique beauty. 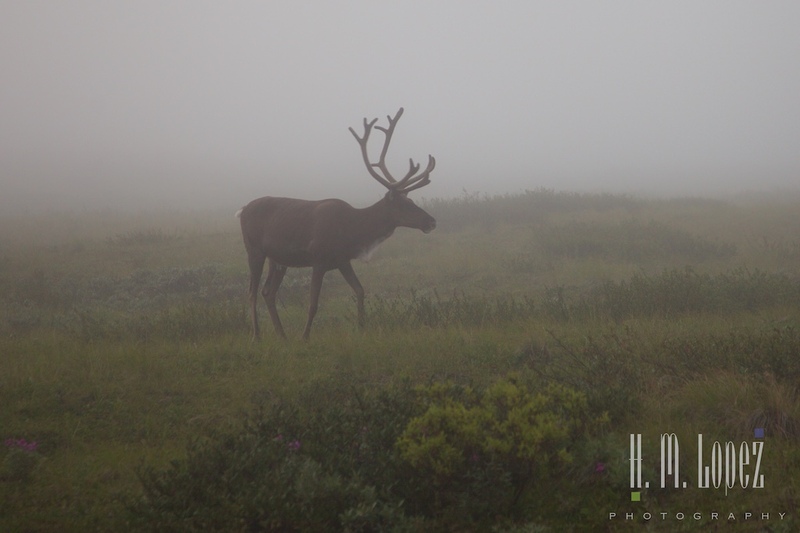 We came across a caribou feeding, silhouetted against the fog. It was a quiet and serene scene and a sweet encounter. 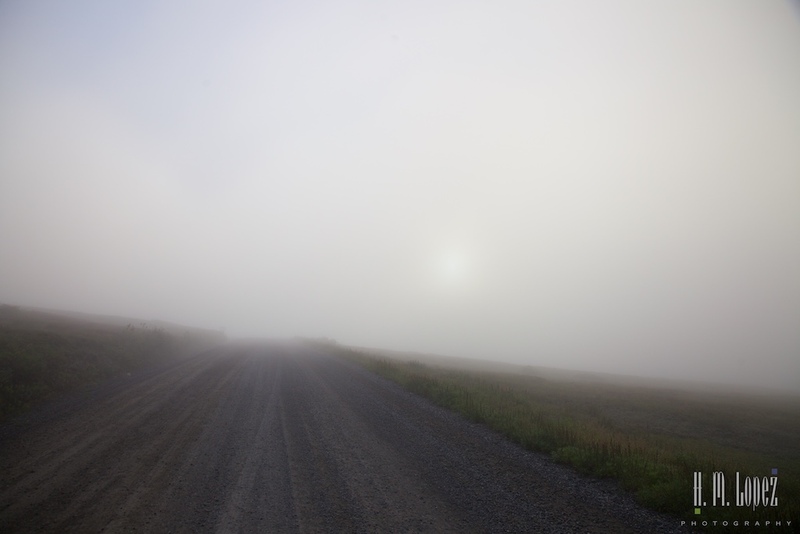 The fog continued as we drove on, covering the landscape. Usually when the “mountain is out” as they say around here, she is first visible up close from the Stony Point overlook. And there is a dramatic moment when you come over the pass and the giant mountain appears. But alas, when we got to Stony Point all was still white with fog. Rats. 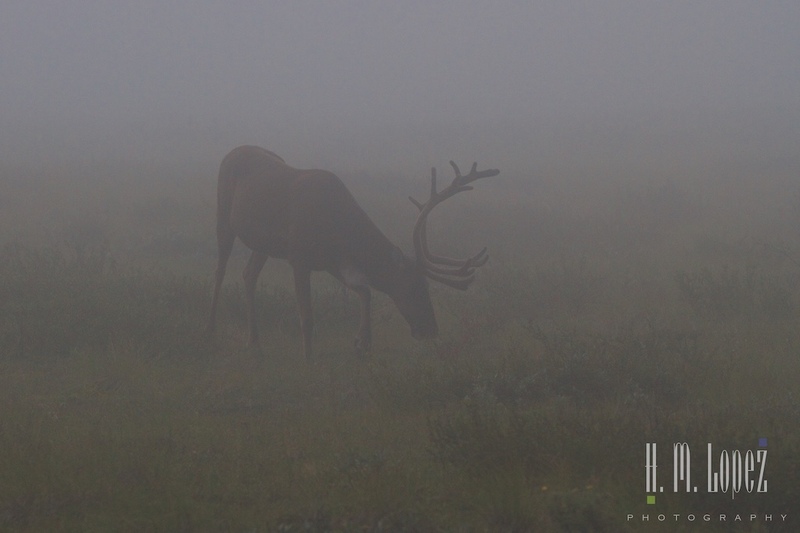 Then, the sun had burned off the fog and as we drove up to the next rise just before the Eilson Visitor Center there she was in full view. Brilliant white against a deep blue sky. A formidable beauty. 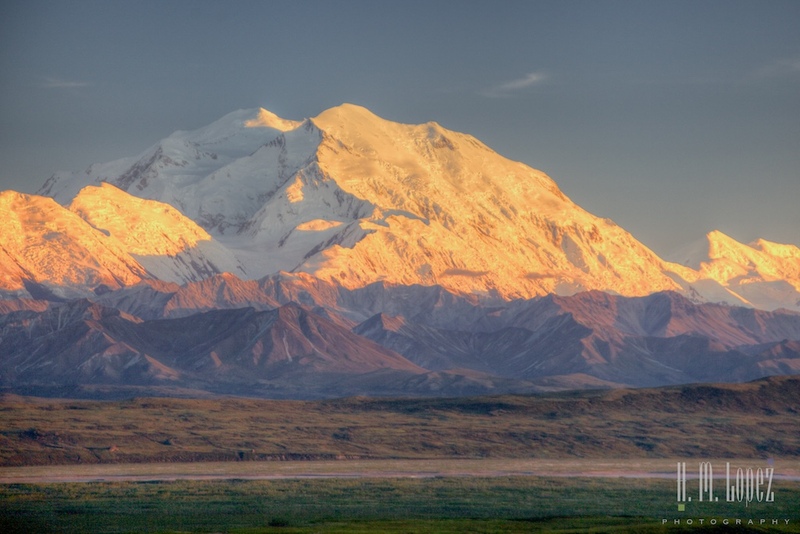 It was the Athabascans that gave the mountain the name Denali, meaning the high one, or the great one for the Tanaina Indians. 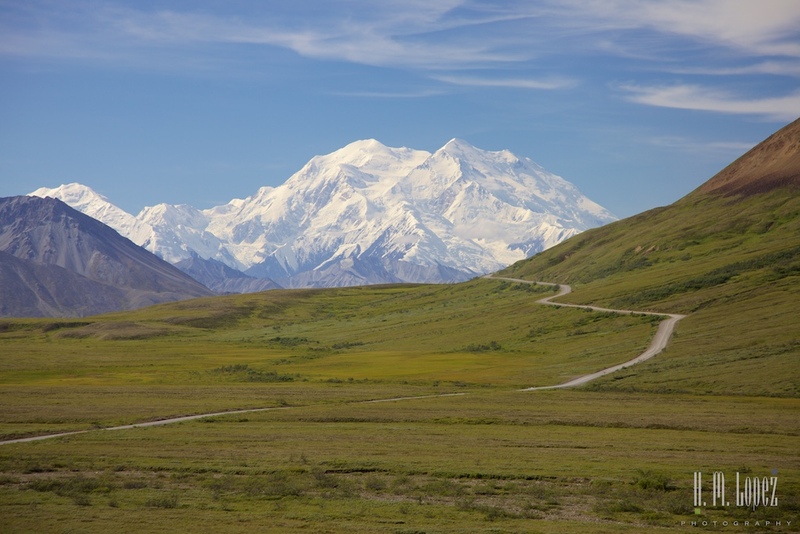 Other Native Americans gave her other names, several of which translate to big mountain. 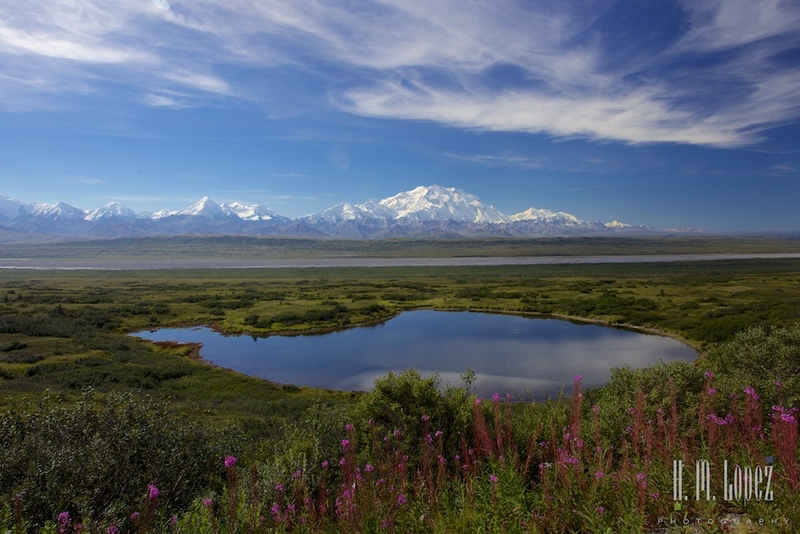 During the Russian ownership of Alaska, the Russians named her Bolshaya Gora (also meaning big mountain). In 1896, a gold prospector named her McKinley in a show of support for the presidential candidate who was a strong proponent of the gold standard. 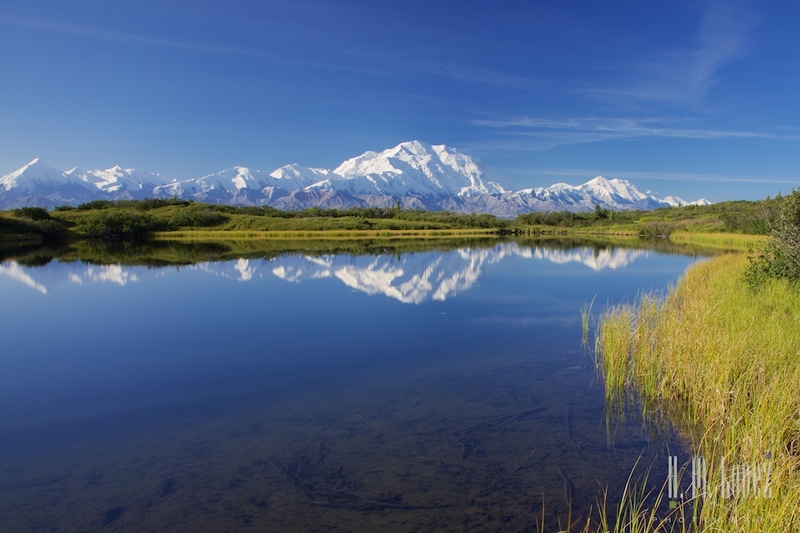 President McKinley was elected, but never visited Alaska.There have been several movements to change her name back to Denali, and the Alaska Historical Commission succeeded in doing so. But the U.S. Board on Geographic Names cannot change her name as long as legislation relating to the name is pending. And an Ohio Congressman (President McKinley was born in Ohio) continually introduces bills to ensure that there is pending legislation. The high one ignites passions on many fronts. I, for one, will call her Denali. 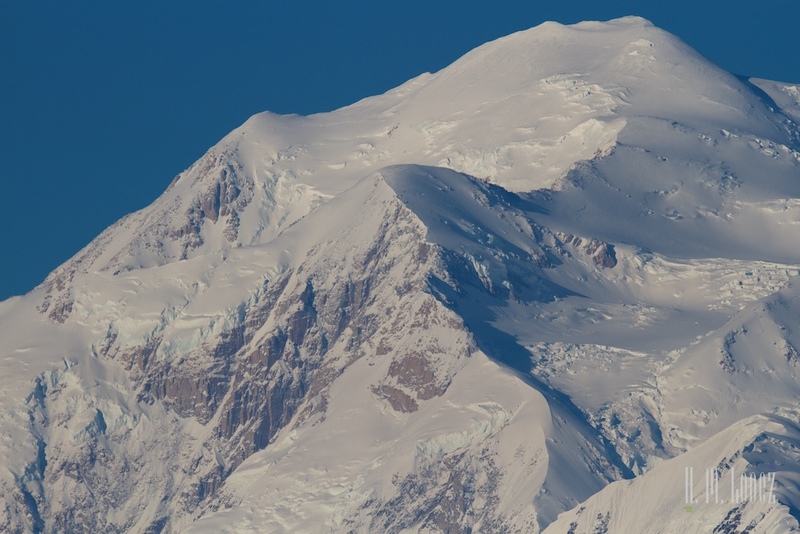 At 20, 237 feet above sea level, she is the highest mountain in all of North America. 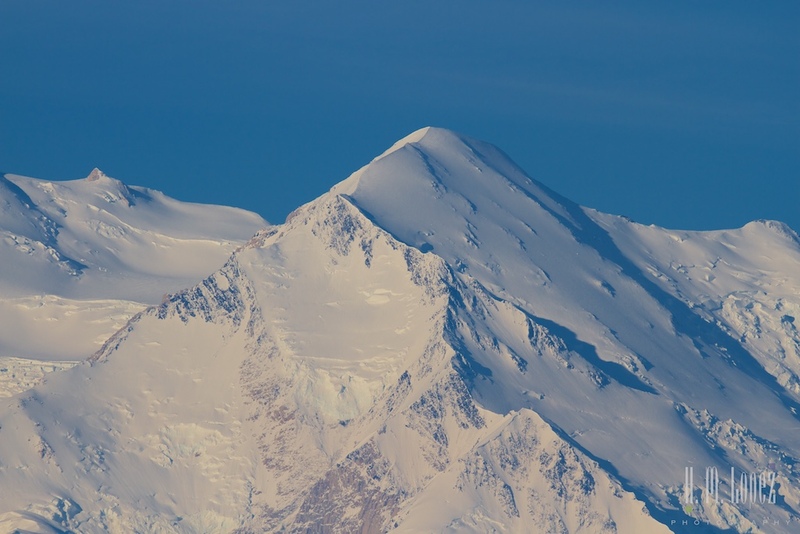 What is even more impressive is that her base is only about 2,000 feet above sea level, so her base to peak measurement, 18,000 feet makes her the largest of any mountain entirely above sea level. Five glaciers flow from the mountain. The Wickersham Wall, on one side of the mountain, is one of the largest continuous walls in the world at 14,900 feet long. She was like no other mountain we had ever seen. Seeing her so fully exposed was a spiritual experience. 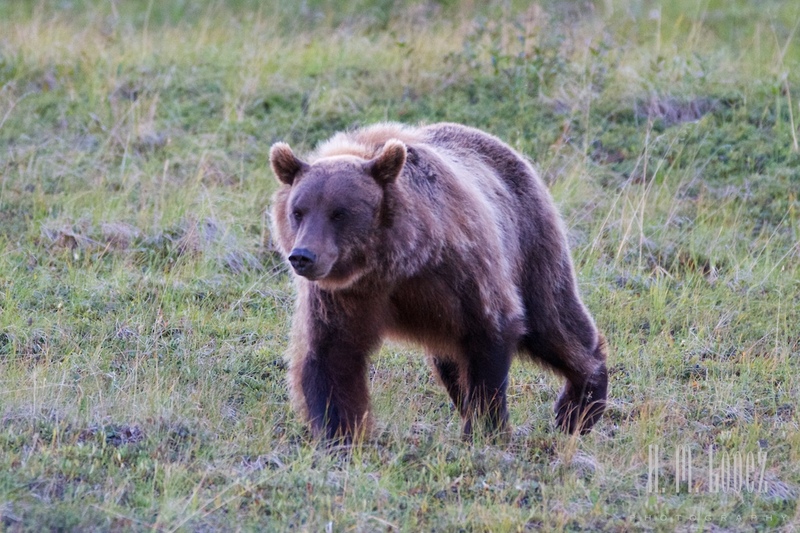 At Eilson Visitor Center, we gazed at her for a long time. Angel sure is a lucky dog, she is one of the few who has seen Denali. Hector and I took turns walking down a small trail in front of the visitor center, one of three defined trails. 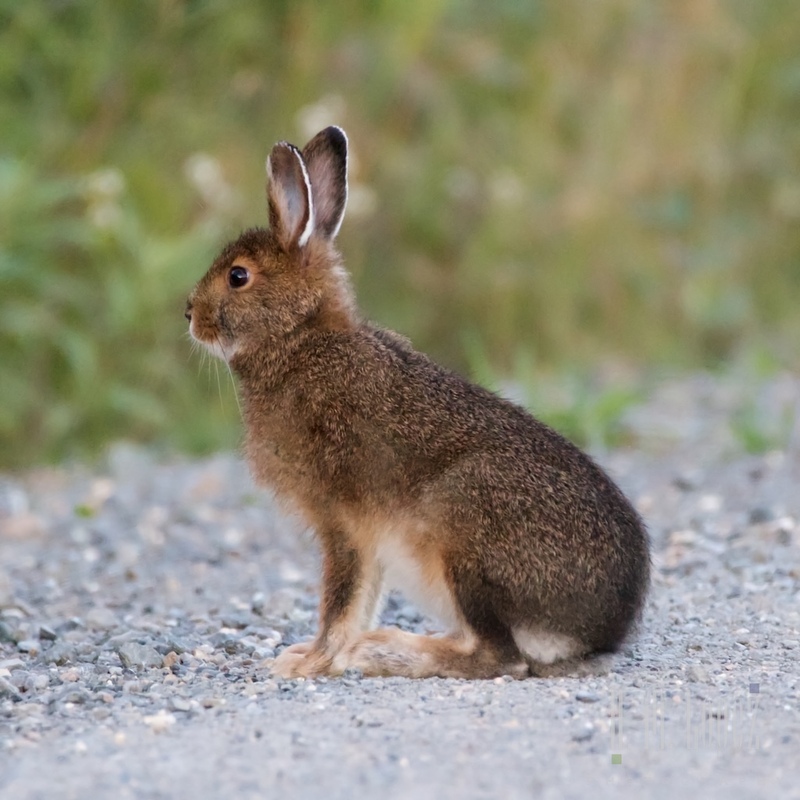 We met one of the other photographers and his passenger at the visitor center (the permits allow one passenger in the car). Although there are supposedly five permits per week, we only saw these two, plus one other that entire week. We left Eilson Visitor Center just after the first bus arrived, heading out to Wonder Lake near the end of the park road. 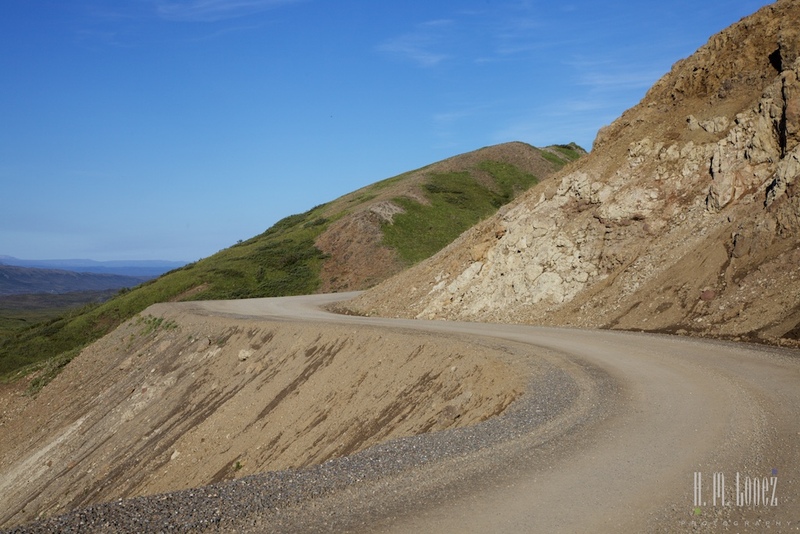 Although the area between Eilson Visitor Center and Wonder Lake is not known for as much wildlife as other areas of the park, the drive is beautiful. 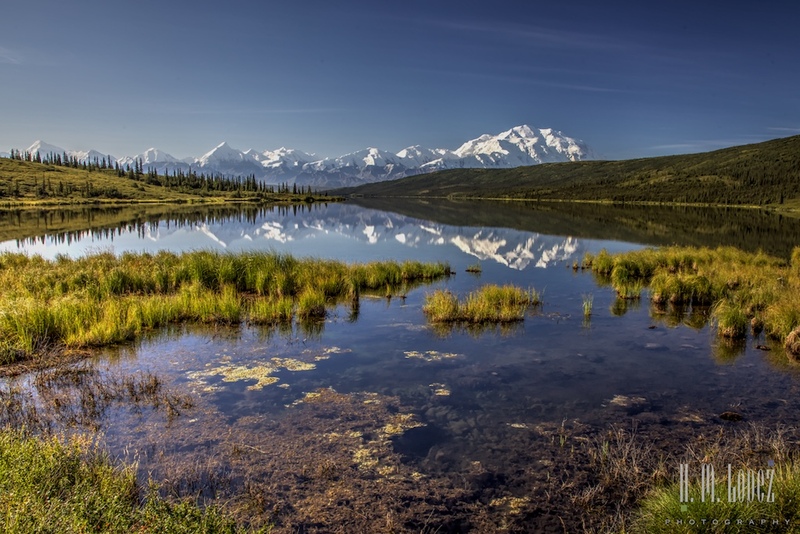 One side is framed by a view of the Alaska Range, with beautiful meadows on both sides of the road. 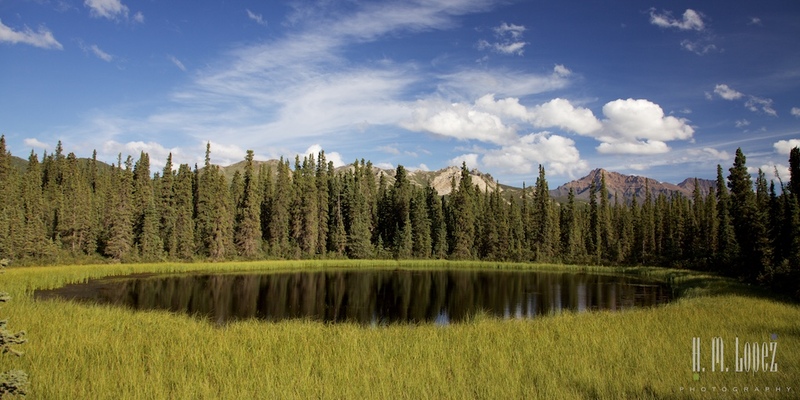 Kettle ponds, formed when blocks of glacial ice melted leaving holes that were then filled with water, dot the meadows. 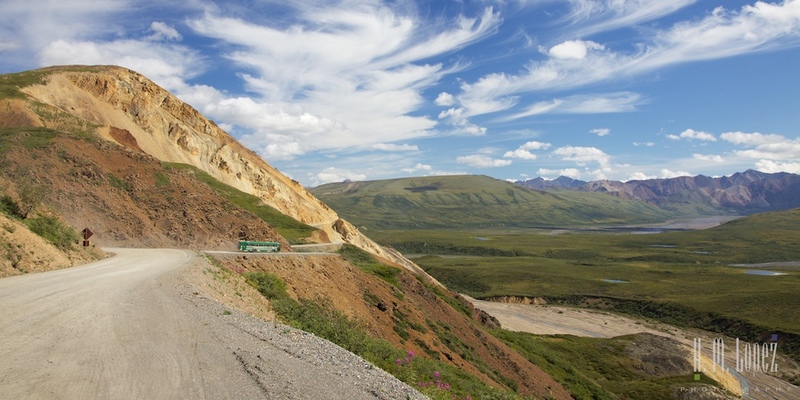 This area of the road also has less traffic, as a number of buses turn around at the Eilson Visitor Center. So we continued on our solitary drive. 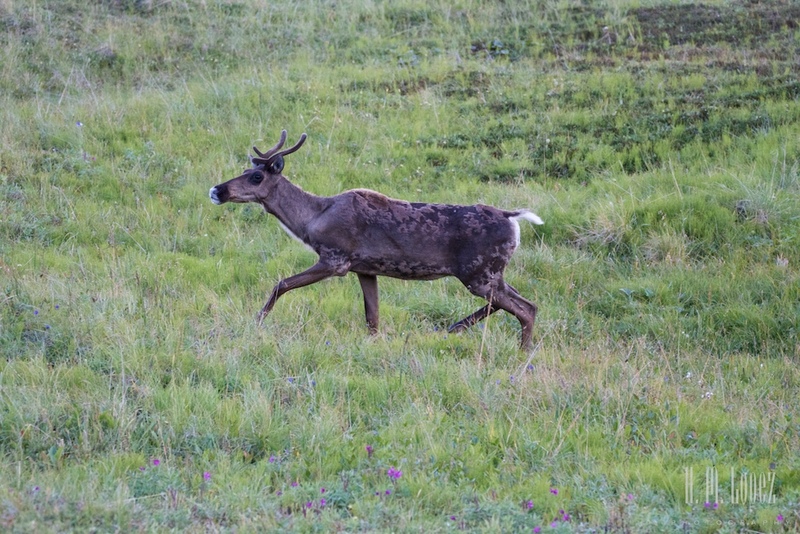 And we saw more caribou, this time running along the valley. We are just loving the caribou. 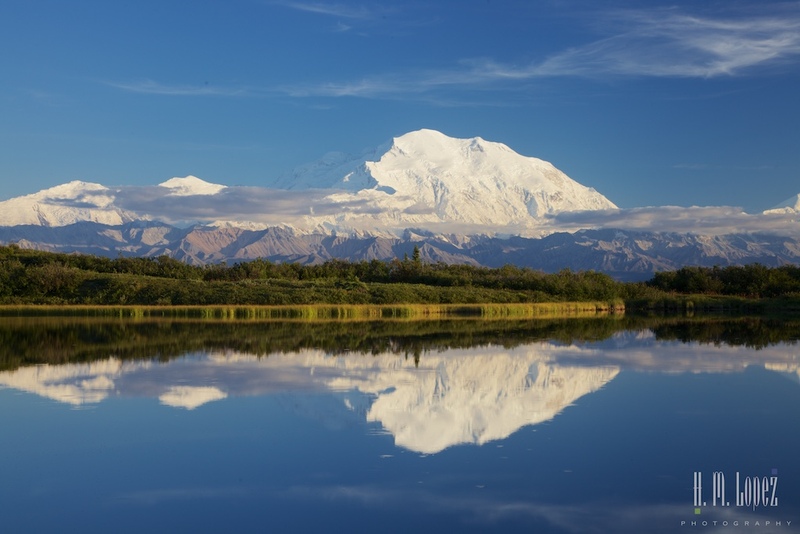 We were eager to see Reflection Pond, where a reflection of Denali can be seen when its water is perfectly still and the mountain is out. It is an iconic photograph but hard to get. Hector wanted to make his version, but it was getting a bit late at just past 9:00 so we were concerned that we were too late. 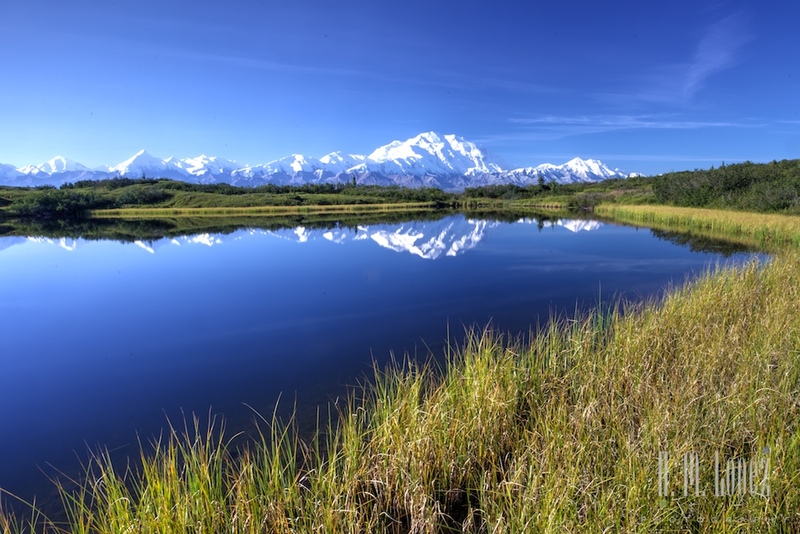 But we again had good fortune; the pond was still and had a lovely reflection of Denali. We were enveloped in quiet and stillness and breathtaking beauty. Hector captured a lot of images of the pond as we walked around it. Just minutes after, the wind kicked up and created ripples across the pond. We continued our drive towards Wonder Lake and had a nice walk by the lake with Angel. And saw yet another beautiful reflection of the mountain. This area near the end of the park road is called Kantishna and gold was mined here at one time. There are several (very expensive) privately owned lodges in Kantishna so we met a few folks walking and biking around the lake. Another peaceful beautiful scene. And then, just for fun, we drove to the end of the road. 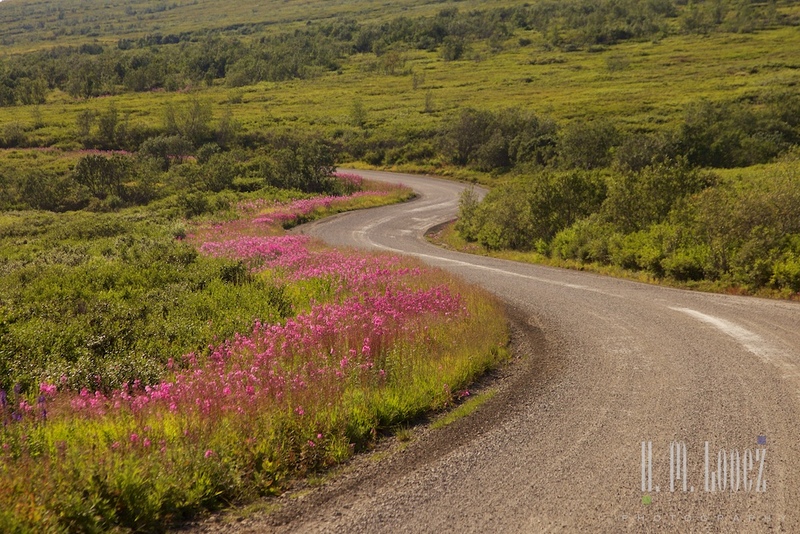 There are some historic cabins and an airstrip on the way and then the road ends at mile 92.5. The light was beginning to get a bit harsh, so we began to head back. By now we were seeing more buses. But there was not a lot of wildlife on this day, apparently because it was a bit too warm with the sun shining so brightly. Clouds began to form, although it was still a mostly sunny day. 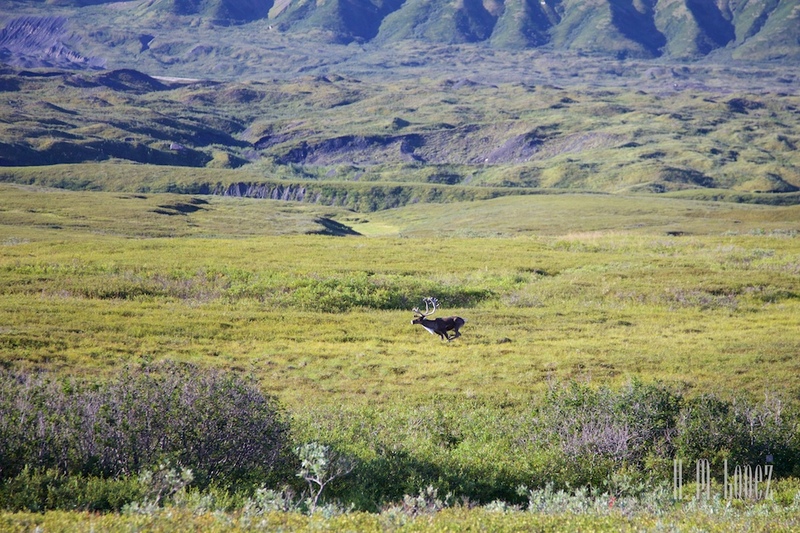 We saw a few more caribou, the only animals that seemed to be out and about. When we crossed over Stony Point on the way back, we were able to finally see the view from there. Back at the campground, we met talented photographer, blogger and fulltimer Bob McQuade. 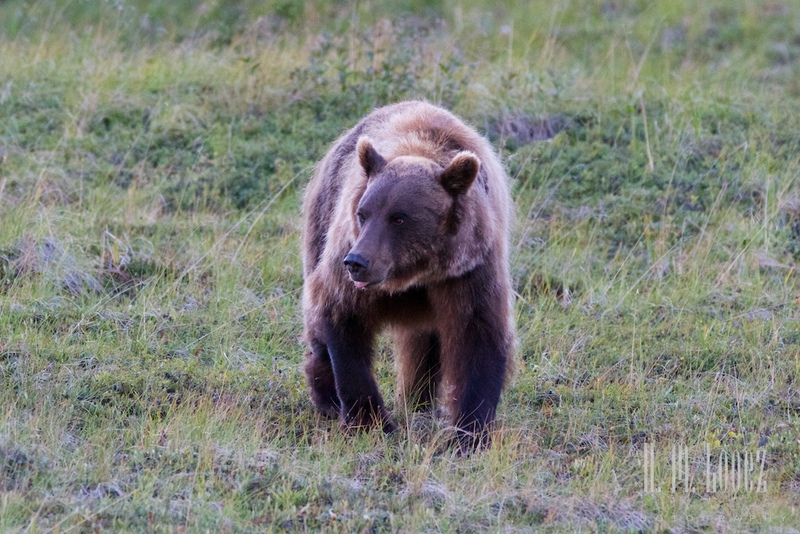 Bob arrived in Alaska quite a bit earlier than we did, and has captured lots of beautiful images. Bob had been riding the bus a few days, and managed to capture some stunning shots of the park. 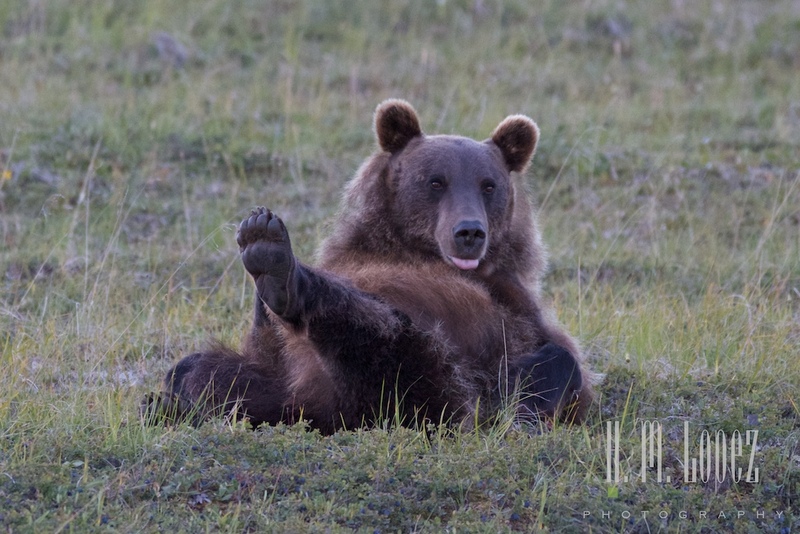 You can see his images on his blog, McQuade Travels. Since the weather was still so nice, we decided to head back out to Wonder Lake in the evening when the light began to get pretty again. This is a very long trip and potentially meant driving on the passes in the dark, but we decided to risk it. 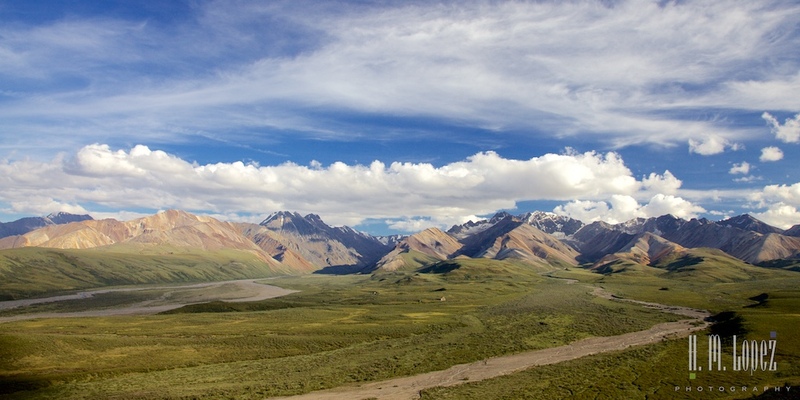 Polychrome Pass, named for its beautiful colors, had not been visible in the fog earlier, but was now surrounded by puffy clouds. We got a closer look at a gyrfalcon perched in a tree, they are such beautiful raptors. 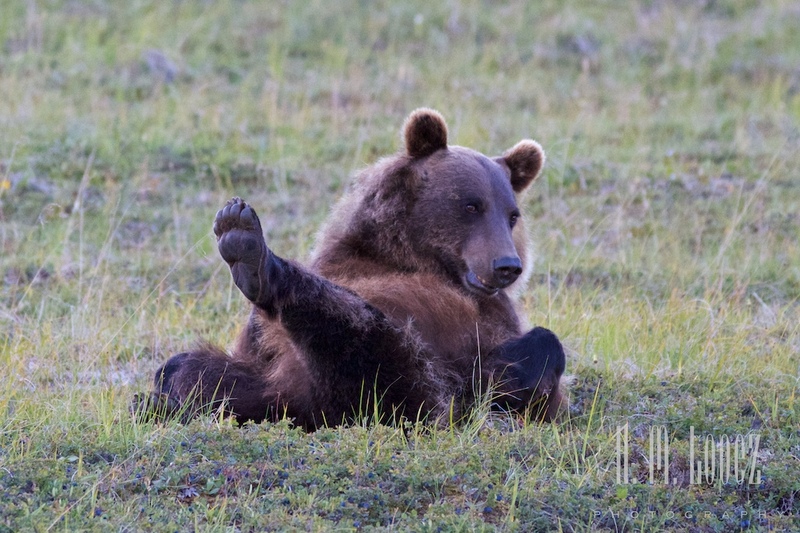 Then we found possibly the most entertaining animal of the week, another grizzly bear. He was munching away and walking around, as they all do. An impressive specimen. Then he turned over to scratch himself. He gave himself a good scratch, then sat up and turned back to his eating. 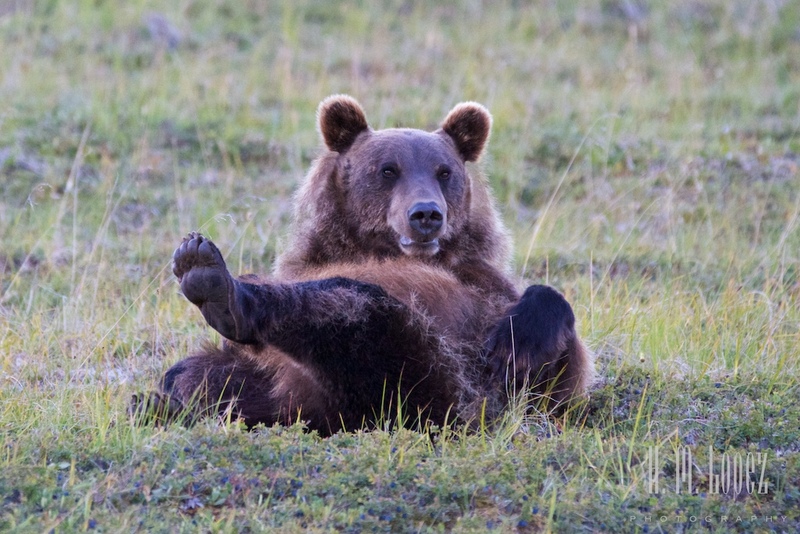 It is amazing to me how these fierce animals can look so harmless with their comical expressions and behavior. Hector laughed so hard I thought the bear was going to run over and pounce on him. 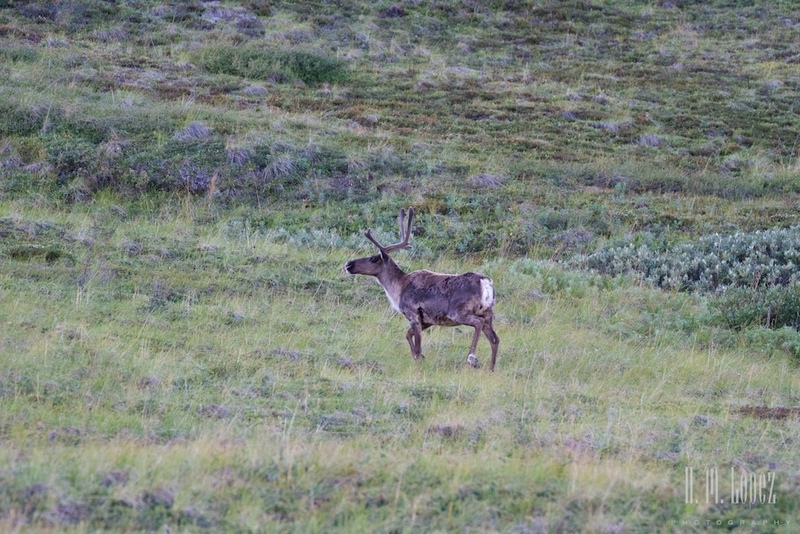 Then, to add drama to the scene, a couple of young caribou walked up. We looked at each other, held our breath and watched. The bear continued munching. 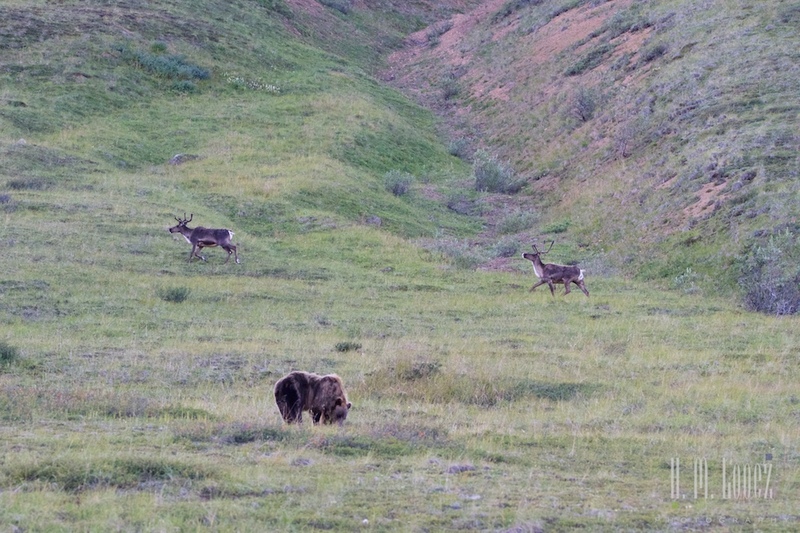 The caribou stopped, clearly studying the bear before proceeding, looking more curious than frightened. 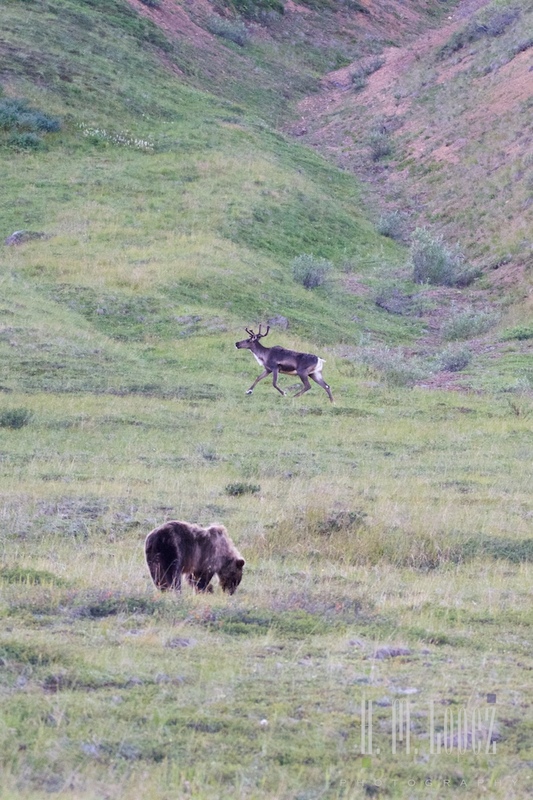 Then a crazy thing happened, the caribou walked across the meadow right in front of the bear. 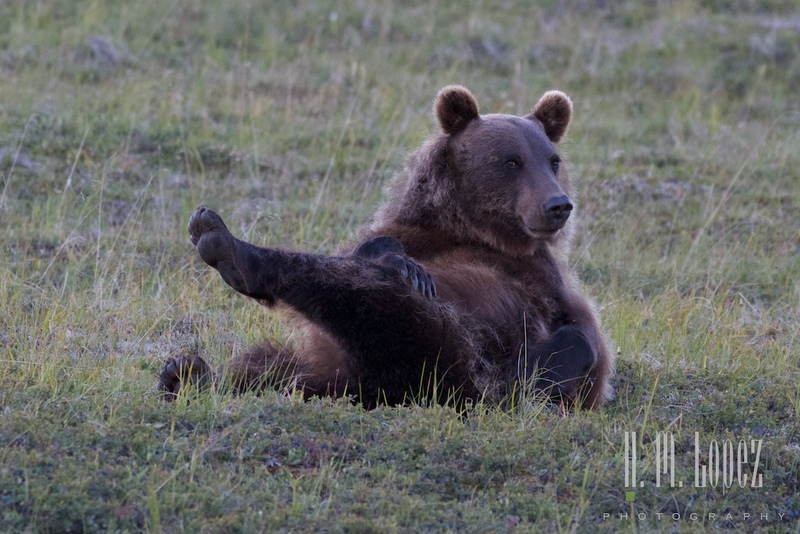 The bear glanced up briefly and then continued his munching. 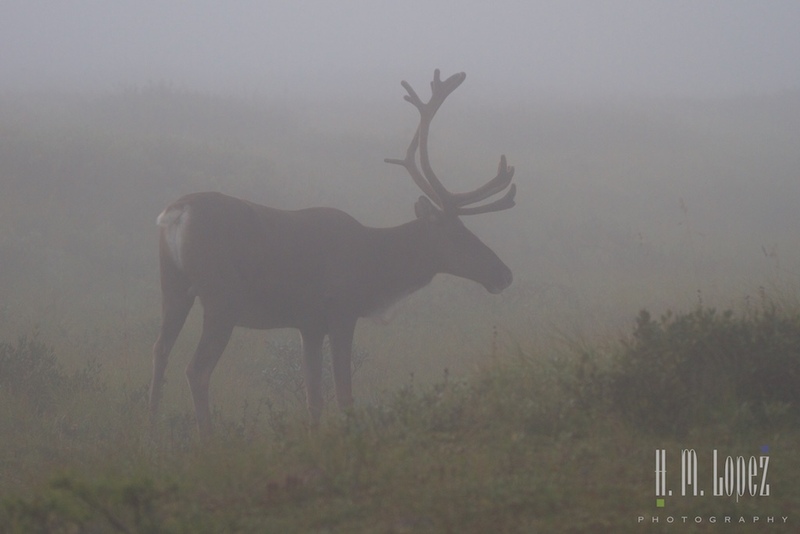 We asked a ranger about this and he told us that even young caribou, if they are healthy can outrun bears and the bears know it. Wow! 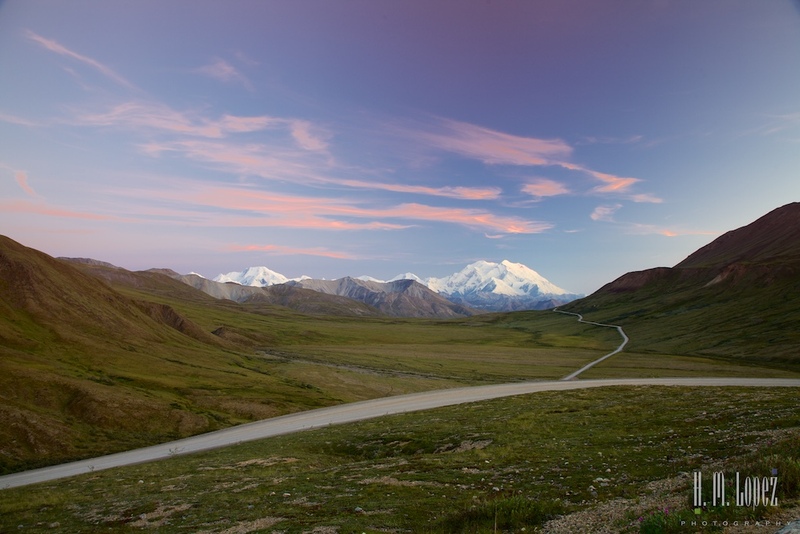 Meanwhile, Denali donned her evening scarf, but was still beautifully visible. 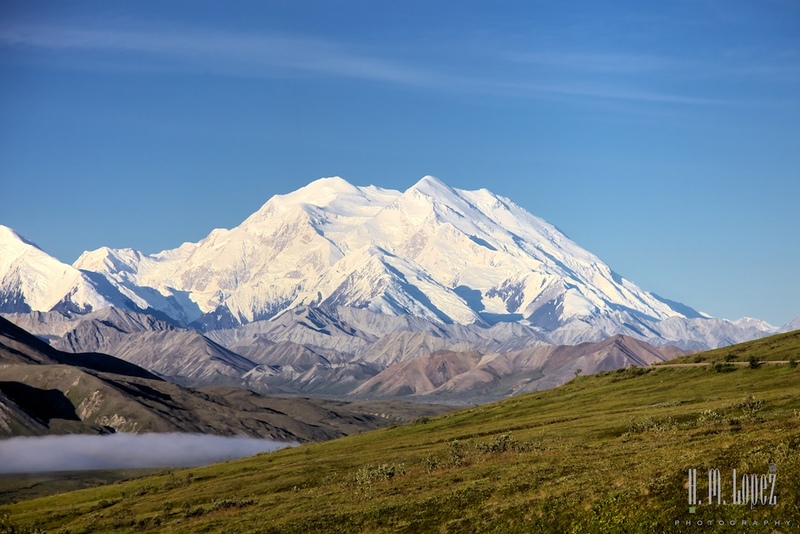 We heard that it is very rare for the mountain to be fully visible an entire day so we wondered if our plan to drive back to Wonder Lake was flawed but we pressed ahead since she was still out. 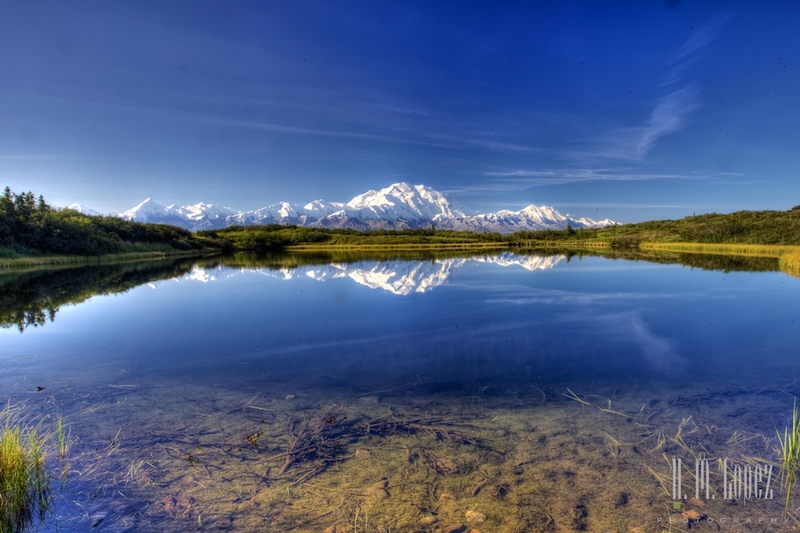 As we reached reflection pond, Denali was still quite visible and absolutely lovely. As was her reflection in the pond and the lake. To capture a perfect reflection twice in one day must be very rare indeed. Once again, in the late evening, all was still and quiet and we were alone. But waiting for sunset at the lake meant driving sixty miles after midnight over four passes and we were tired. So we chose to head back and watch the sunset developing on our way. 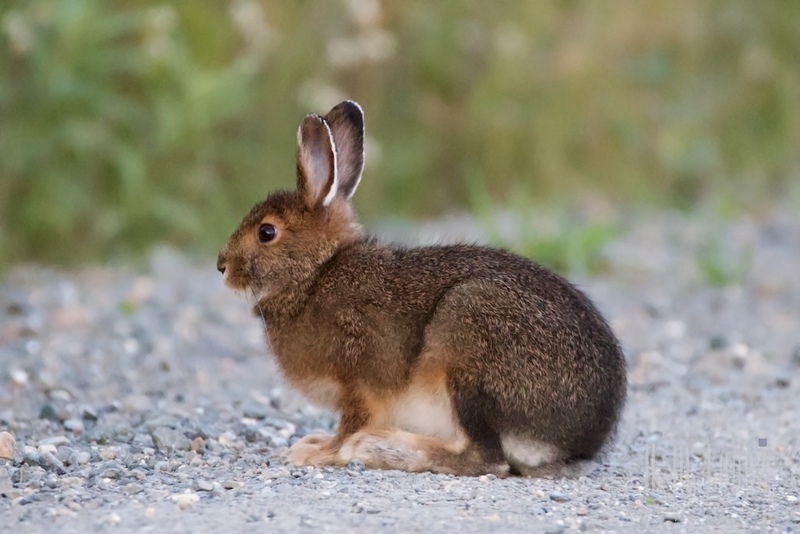 Never forgetting the little plants and animals, Hector took photos of our first snowshoe hare. He too, like the ptarmigan. will be pure white in the winter. Nature is so amazing! 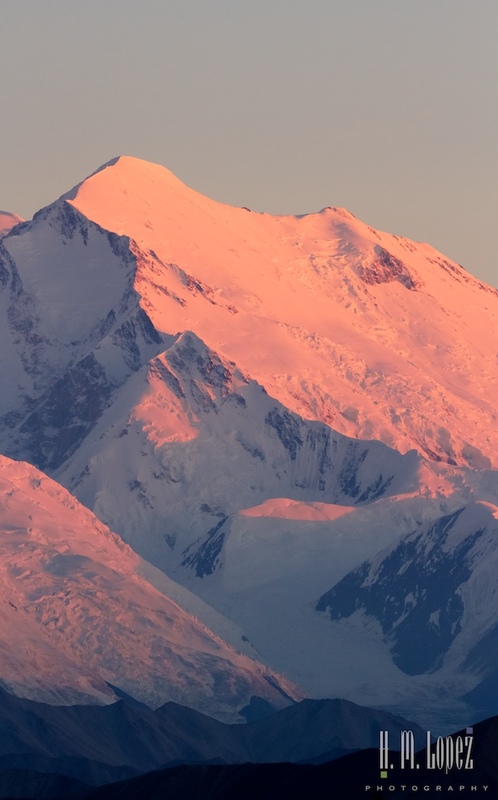 As the sun sank lower in the sky, the Alaska Range began to have a rosy glow, alpenglow, which is always so beautiful. 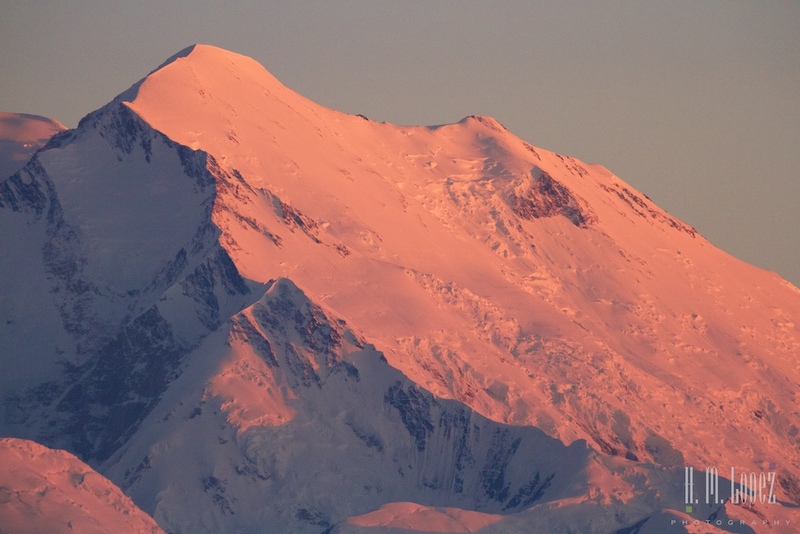 The top of Denali was also in alpenglow which grew deeper as the night progressed. 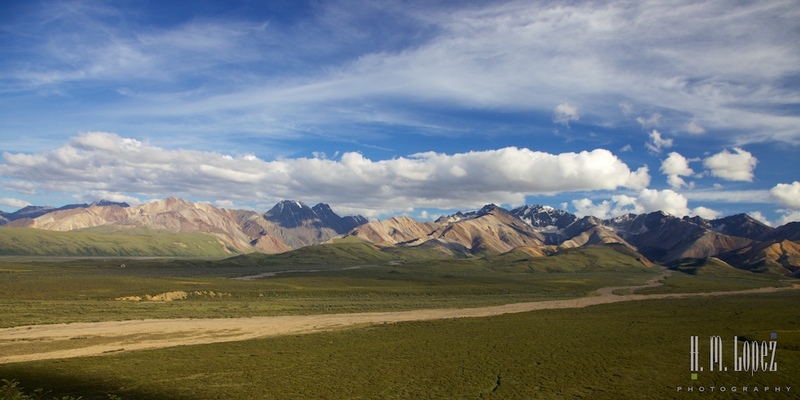 As we reached the trickiest pass, Polychrome Pass, our good fortune remained with us. It was still dusk with just enough light to guide our way. 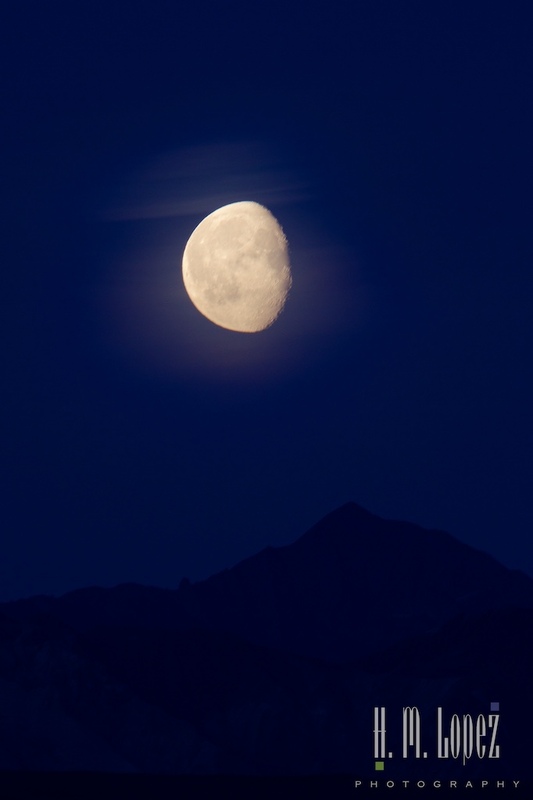 Then as we reached the last pass on our way home, Sable Pass, the moon rose. 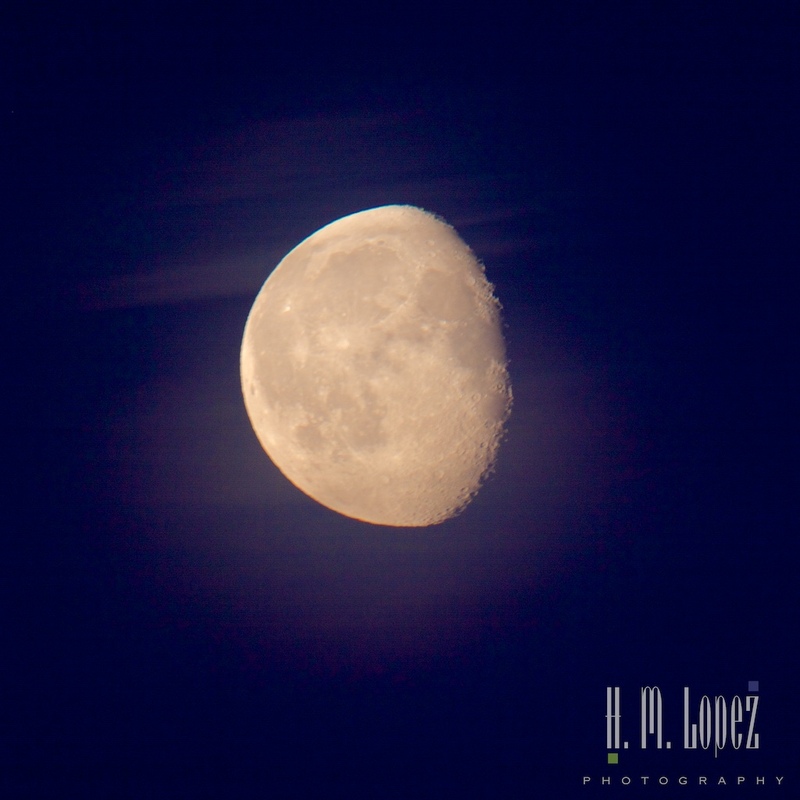 It was three days past the full moon, but she still shone brightly. We reached the campground at midnight under the glow of the beautiful moon. Our hearts were grateful for this incredible day full of unending good fortune. 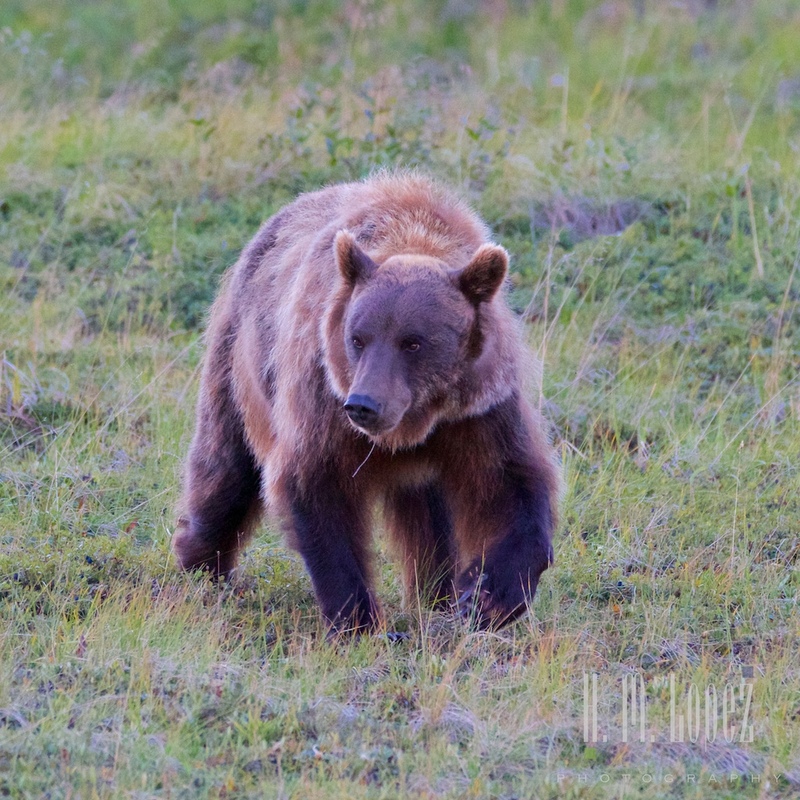 This entry was posted in Alaska, Our 2015 Journey to Alaska, RV fulltimers, States Visited and tagged birdwatching, dry camping, flowers, fog, mountains, national parks, raptors, Roads, sunrise, sunsets, wildlife by islandgirlwalkabout. Bookmark the permalink. the photography is so breathtaking and your words so vivid it really did take my breath away. I felt more moved by this than any post yet! Thank you, the week was really quite moving. Miss you! Wow, whatI credible pictures! You must have been absolutely thrilled! Thanks for sharing these. Yes, we were. Glad you enjoyed them! Spectacular and Breathtaking! Hector your photography is just phenomenal, especially the reflection shots and the alpenglow! 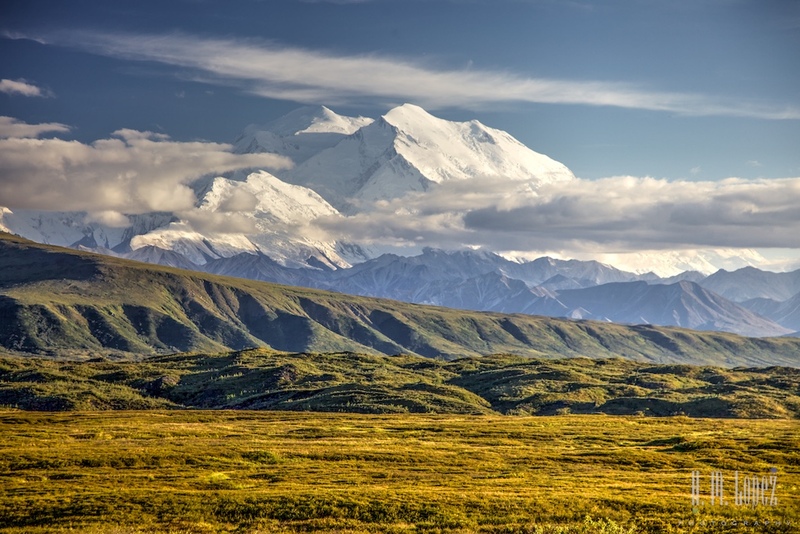 It is really spiritual when Denali shows off. You are so fortunate to see her in its full glory the whole day. I can sense your elation. Thank you again for taking me back there, great memories! So happy to bring back good memories, and yes, he outdid himself! 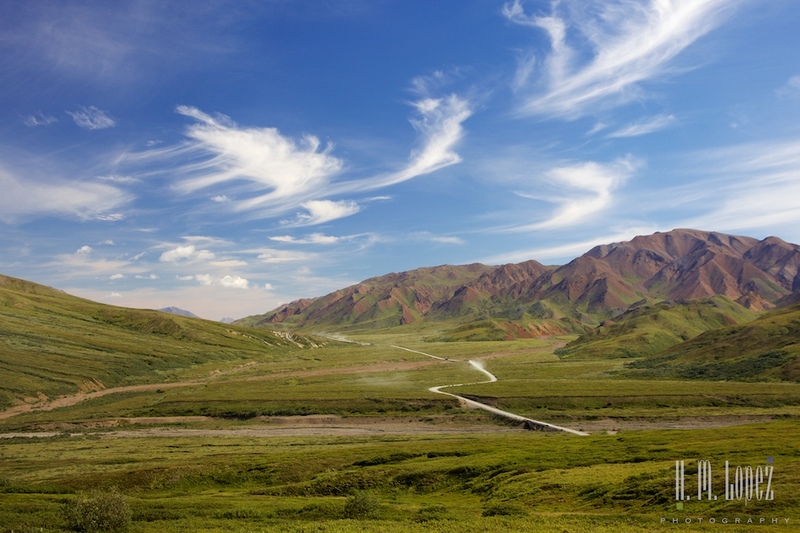 In case you go back near the Eilson visitor center, the alpine trail takes you up the mountain with grand views of the ranges and meadows behind it. It’s a short uphill climb but the windflowers are abundant along the trail. The trailhead is across the road. We too shall call her Denali!!!! Breathtaking photos and I could feel the quiet and serenity in the pictures and the narrative. You guys should do this full time, Hey, you do! Wonderful post and I really love the reflection ponds pics. The reflections in the pond! Stunning. Wow, wow, wow. thanks for sharing these images of your wonderful day exploring this beautiful place. Glad you enjoyed them, it is truly stunning. What an incredible day! The photographs are stunning. 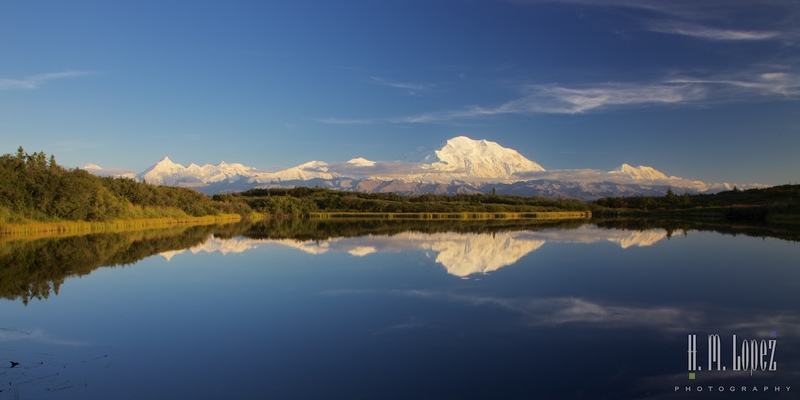 To be able to see Denali from so many places all in one day probably doesn’t happen very often. 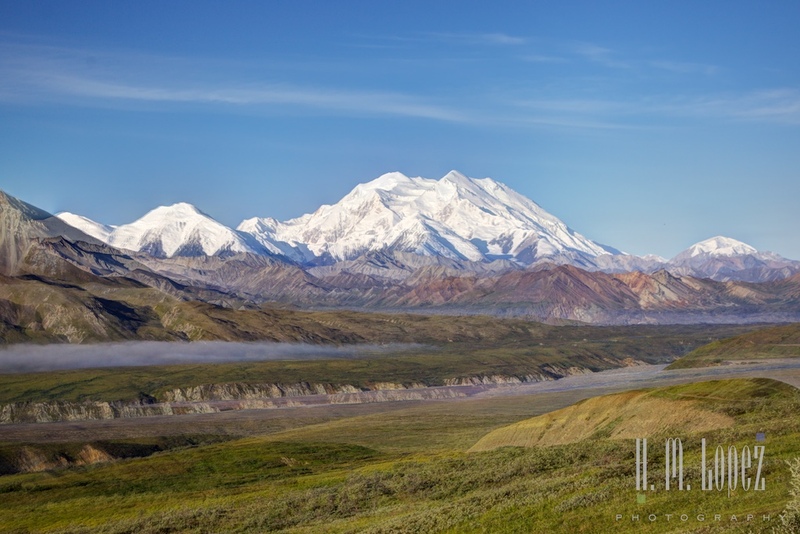 We had fog every day when we were in the park and didn’t see Denali until we got to Talkeetna. 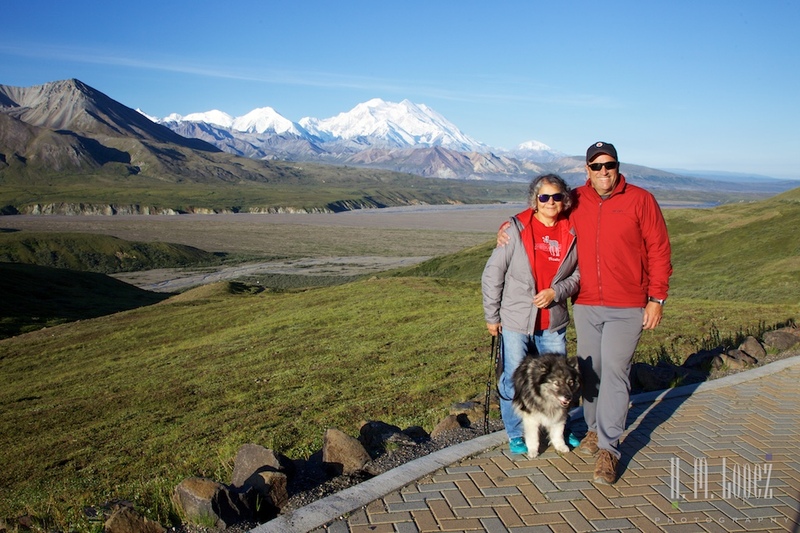 Eight years ago when we came to Alaska for the first time, we were in Talkeetna 3 days and around Denali 2 days and never saw her. I do think it’s rare to see her from the entire park road in one day. WOW! Thank you for sharing your travels with us! 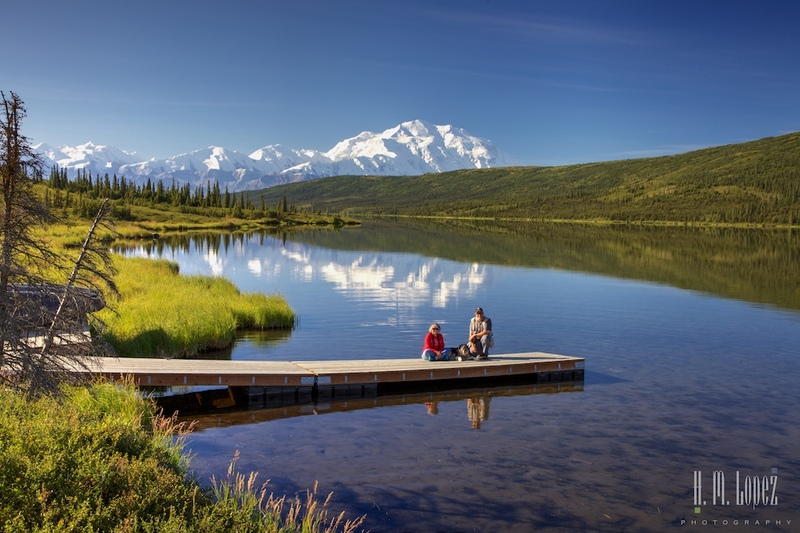 I feel privileged to be able to experience Alaska through your trip. Thank you! Glad you are enjoying the blog! What a fabulous day filled with wonderful photo ops. Karma was with you that day. 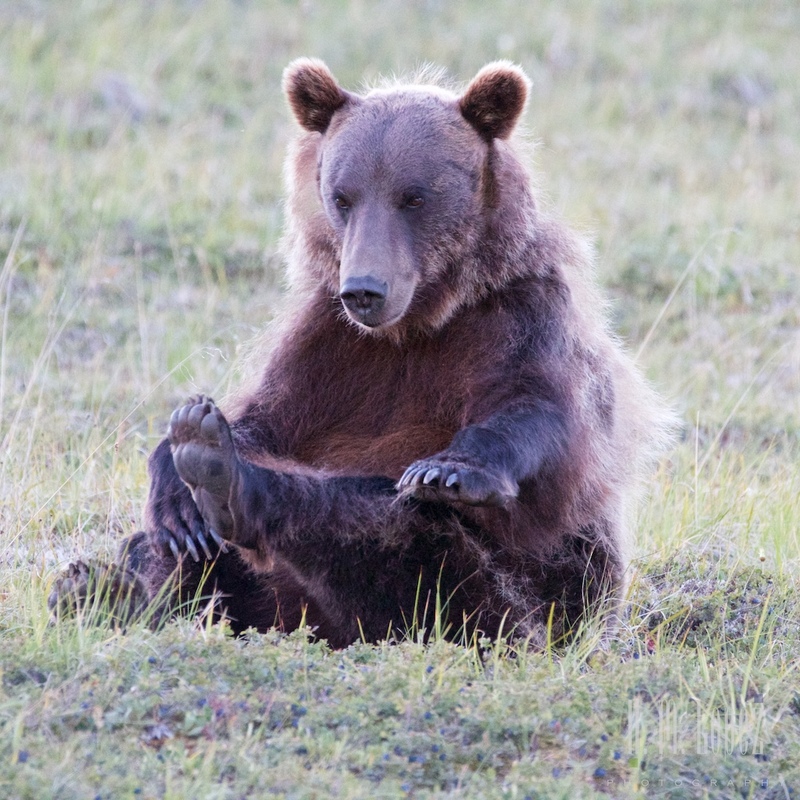 Love those Bear photos… comical guy! You are quite right about the karma! We have been very fortunate. The bear was a hoot! Although I know you’ve had a wonderful time in Alaska, I can only imagine that this day will be the highlight of your summer. 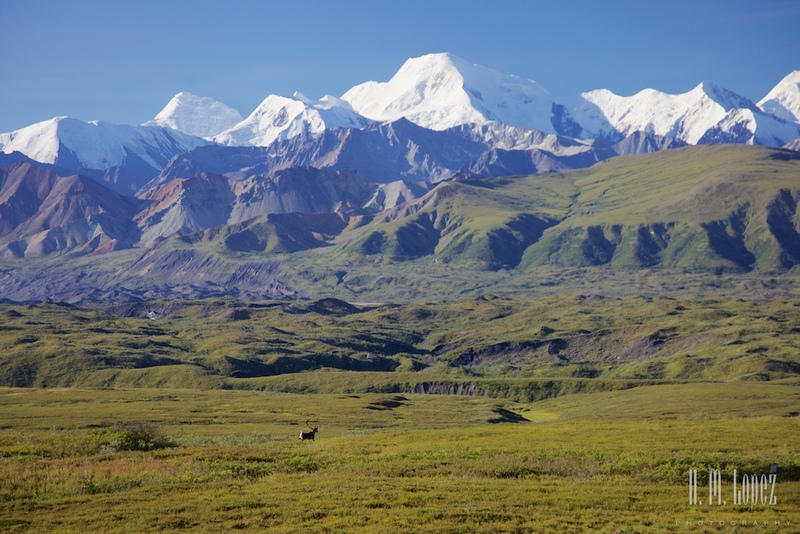 The images and description of your encounters with Denali are breathtaking. I felt as though I were traveling with you. Thank you for sharing such a special day with us. The entire week was the highlight, indescribable. Glad you enjoyed! You’re welcome! We love sharing our journey. 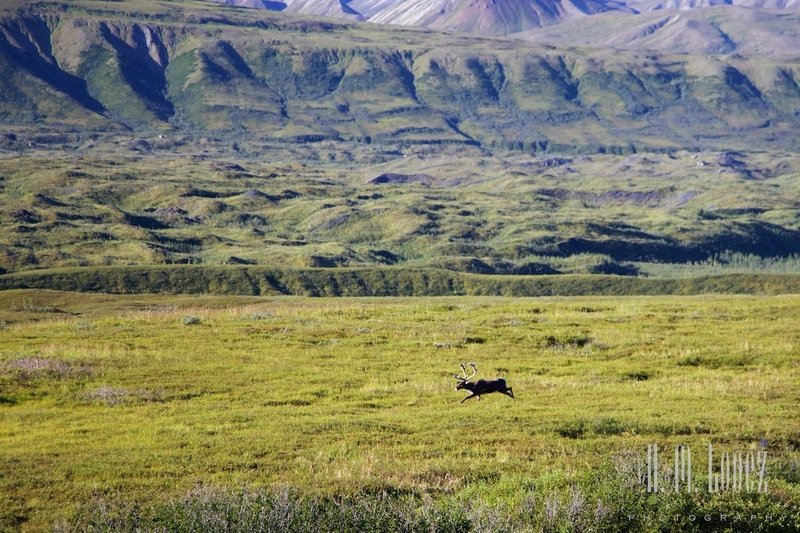 Denali was truly the highlight, but we have seen so many beautiful places this summer. 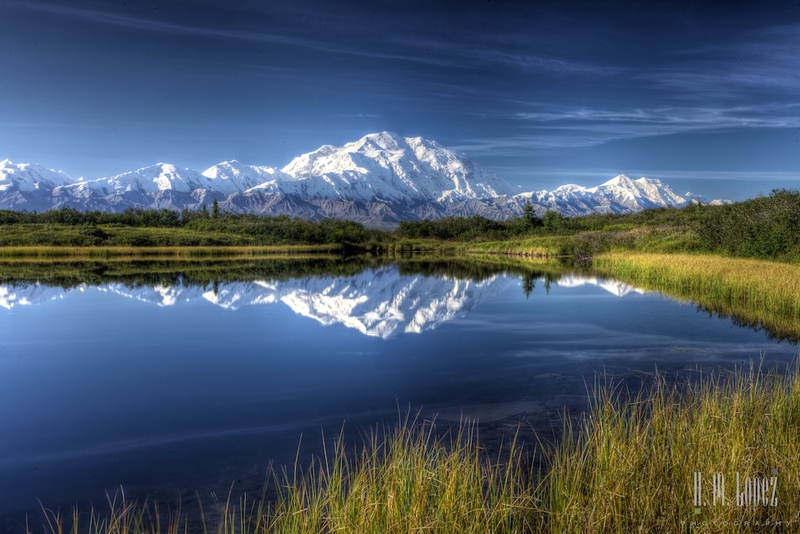 I adore your bear photos but those images of Denali at Reflection Pond…exquisite! Have you two stopped grinning yet after this perfect day? We were speechless a lot of the time. wow! You really made the most of that photographers pass. Gorgeous shots all around!! The lake reflections are amazing. Bravo! Thank you, more to come! Thanks, Barry, glad you are enjoying it! So glad you are with us! Miss you! Hector, these are some of your best pix yet! 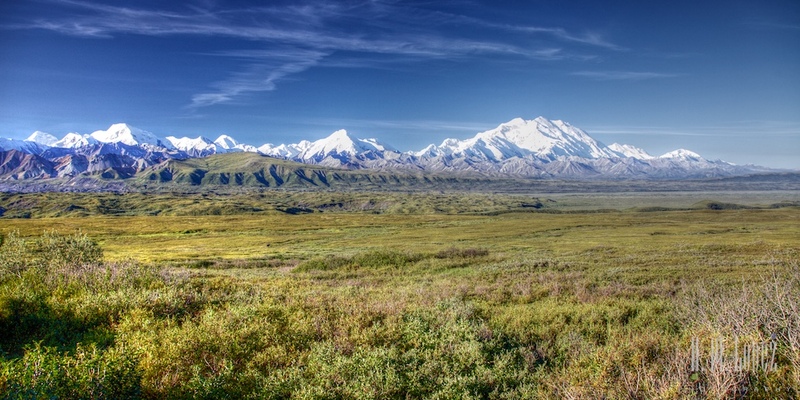 The Sellers saw Denali back in the mid-90s, and we only had one day nearby. But it was beautiful and we saw it from helicopters, range rovers, canoe and small plane! Alaska Rocks! Last time we went we had one day also but we were just on the bus. Sounds like you had some great viewpoints. 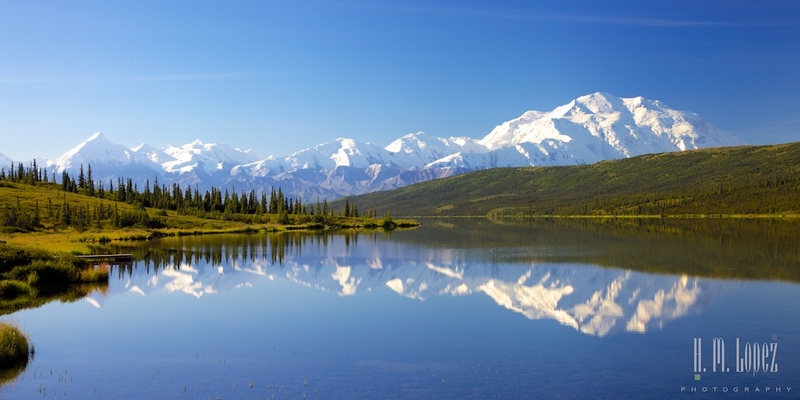 We love Alaska too! OK, now I’m REALLY jealous. Nice reflection shots, Hector!